Executive Chef and founder of The Flavor Chef, a professional chef services company out of Carlsbad, California, Lance Roll excels at making incredibly delicious food for his catering clients, his personal chef clients, and his corporate account clients. 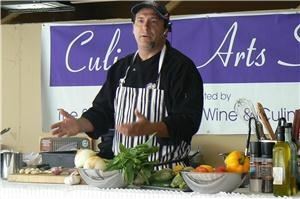 Lance puts his intuitive ability with food together with a 20-year diverse culinary career to create healthy, imaginative cuisine for all of his catering events.By using locally-grown, organic produce and free-range, humanely-raised meats and poultry, The Flavor Chef is able to bring extremely well-balanced and beautiful food to your table. Lance blends his culinary expertise with the concepts learned in lifestyle coaching )to create personalized menus for each catering client. Lance uses LOVE as his ultimate spice to greatly enhance all the food he creates. By being an environmetally consciuos caterer and chef, the flavor chef is is bringing organic catering to a new level. Visit his website www.theflavorchef.com and *NOT DISPLAYED* or call him at *NOT DISPLAYED* for more information.